Visit Alki Beach and Golden Gardens Park for some beach relaxation. Take a break from the city and head to Hiram M. Chittenden Locks and Mount Walker. Explore Seattle's surroundings by going to Bloedel Reserve (in Bainbridge Island), Tacoma (Point Defiance Zoo & Aquarium & Chihuly Bridge of Glass) and Snoqualmie Falls (in Snoqualmie). Dedicate the 14th (Wed) to wine at some of the top wineries in the area. 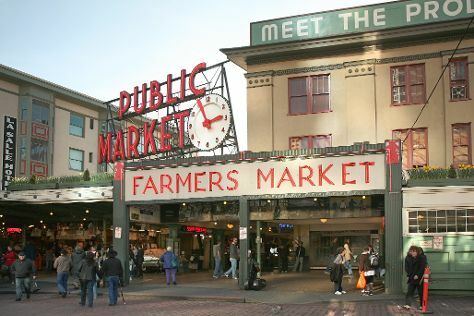 Next up on the itinerary: wander the streets of Pike Place Market, admire nature's wide array of creatures at Seattle Aquarium, admire all the interesting features of Safeco Field, and shop like a local with Pioneer Square. To see where to stay, maps, traveler tips, and tourist information, use the Seattle trip itinerary planner. New York City to Seattle is an approximately 8.5-hour flight. You can also drive; or take a bus. Due to the time zone difference, you'll gain 3 hours traveling from New York City to Seattle. Traveling from New York City in May, expect a bit cooler with lows of 49°F in Seattle. Finish your sightseeing early on the 16th (Fri) to allow enough time to travel to Los Angeles. Visit Santa Monica Pier and El Pueblo de Los Angeles for their historical value. You'll enjoy a bit of beach vacationing at Venice Beach and Boardwalk and Manhattan Beach. Get out of town with these interesting Los Angeles side-trips: Hermosa Beach Pier (in Hermosa Beach), Malibu (Malibu Lagoon State Beach & Zuma Beach) and Anaheim (Disneyland Park & Disney California Adventure Park). Pack the 18th (Sun) with family-friendly diversions at Universal Studios Hollywood. There's lots more to do: kick back and relax at Santa Monica Beach, get to know the fascinating history of Hollywood Walk of Fame, immerse yourself in nature at Topanga State Park, and contemplate the waterfront views at Santa Monica Bay. To find maps, reviews, ratings, and tourist information, refer to the Los Angeles trip itinerary builder. You can fly from Seattle to Los Angeles in 4.5 hours. Alternatively, you can drive; or take a bus. In June, Los Angeles is a bit warmer than Seattle - with highs of 77°F and lows of 61°F. You'll have a few hours on the 7th (Fri) to wrap things up before traveling home.